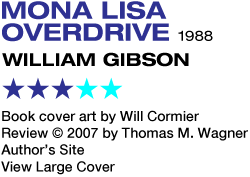 A direct sequel to Neuromancer, Mona Lisa Overdrive shows William Gibson perhaps a bit too self-conscious of his stature as a leading SF superstar from whom great things are now routinely expected. So he sets about here trying to push his own envelopes and cut his own edges. The resulting story is a hell of a mess, a convoluted literary Rubik's Cube whose sides stubbornly refuse to match up no matter how much you play with it. Yet it's a testament to Gibson's still fecund talents that much of its entertainment value lies in wanting to solve it. In all honesty it doesn't fully work, and Mona Lisa Overdrive remains Gibson's least artistically successful story to date. But you're never really wasting your time watching a genius at play, even when he drops the ball. For most of the book, it seems as if Gibson is steadfastly and infuriatingly avoiding establishing a plot. In fact he's having fun taking his time, defying conventions of plot development. He offers four wildly disparate story threads, each with its own protagonist, and allows them slowly to graft themselves together as organically as he can. We are introduced to Angie Mitchell, a cyberspace celebrity with the rare talent of being able to enter that virtual world without jacking in physically. Kumiko is a young Japanese girl sent by her yakuza father to safety in England, away from an incipient gangland war, only to find herself embroiled in a deliriously confused scheme involving Case's cohort Molly from Neuromancer, now living under the name Sally Shears. Sally/Molly is being blackmailed to participate in a plan to kidnap Angie, using a young, clueless prostitute, Mona (also briefly referenced in Neuromancer) to undergo cosmetic surgery and replace her. But Sally/Molly ain't the sort of girl to take this kind of thing lying down, and decides to double-cross and get the drop on her employers, by kidnapping Angie ahead of schedule to protect her. Finally, Slick Henry is a lowlife from the Sprawl who finds himself looking after Angie's catatonic lover, Bobby, who's jacked into the matrix where he's apparently experiencing something of staggering import. Much of this — exactly how all of these characters relate to one another — remains frustratingly opaque until you get into the book's final third. Mona Lisa Overdrive actually has much more, and much better, action than Neuromancer, though with a narrative much less tight (not to mention focused) than that of Count Zero. Again, Gibson's gift for texture stands him in good stead. The novel's greatest pleasure lies in the ease with which Gibson's future can be richly visualized: a big-budget widescreen diorama of urban decadence and technological anarchy that only the imagination could do justice. But after spending 300 pages unraveling this knotted narrative, a disappointing anticlimax awaits at the end. 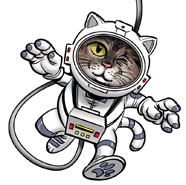 It isn't much of a surprise — especially when the eccentric, orbital Tessier-Ashpool clan comes back into the picture — who's responsible for everything. And the final scenes offer up some of the silliest melodramatic villain dialogue to come down the pike this side of epic fantasy. ("Die! You'll die! I'm killing you! Now!") It's a real shame, because throughout the book Gibson develops the concept of cyberspace beyond Neuromancer, and the intriguing idea that new, virtually godlike AI entities are arising there isn't given the depth of attention I would have liked. (Really, it presages the Singularitarian SF that would become popular around the turn of the century.) In the end, what pleasures you derive from Mona Lisa Overdrive will most likely have to do with the tactile thrill of racing through Gibson's grittily realized world. Stalwart fans of the man will naturally want to notch the rating upward. If the journey here is more satisfying than the destination, you can't be too hard on the guy. It's a lot of work, living up to such colossal expectations.